In previous reviews, I have extolled the virtues of the impressive Kaleidescape networked AV system. With the exception of the Mini/Cinema One, a Kaleidescape system consists of two types of component. The first is a powerful media server, located in an equipment room or basement, that contains a number of high-capacity hard drives. Your movies and music are copied bit-by-bit and stored on these during the importation process, and RAID-K technology minimises the chance of losing anything in the event of a drive fault. One or more players are connected via the network, located in the rooms where playback is required. Everything is built from high-end hardware, and has the same levels of performance that can be expected from top-flight AV gear. Kaleidescape has two new players that offer Blu-ray compatibility, the compact M300 and the M500 tested here. The latter includes an in-built Blu-ray/CD/DVD drive for direct playback and importation. Although the importation service offered by Kaleidescape dealers now caters for Blu-rays as well as CDs and DVDs, it is advised to have at least one M500 so that you can easily import new discs into your system as and when they are acquired. And servers? All existing and current models will work, but the newer ones boast the capacities needed to accommodate a decent collection of Blu-ray content. There are two types of server. One, which is 1 rack-mount unit ('1U') high, contains four cartridge-loaded 2TB drives and can accommodate up to 900 DVDs, 150 Blu-rays, approximately 10,000 CDs or a mix of the three. The higher-spec model is 3U high and its 14 cartridges basically quadruple the storage capacity of the 1U server. The 3U model's fourteenth cartridge is a 'hot spare', provided for extra protection. If even greater capacity is required, multiple servers can be used. For Blu-ray playback, a third component becomes necessary. This 100-disc Blu-ray carousel, referred to by Kaleidescape as a Modular Disc Vault, is the key to how the company has managed to placate the studios. Any Blu-ray disc that has been imported onto the server has to subsequently be loaded into this vault, which is connected to one of the players via a USB. You cannot play a previously imported Blu-ray if the physical disc is not present – its entry in the various movie lists is greyed out. Mercifully, there's no clunking from the vault when a Blu-ray is selected for playback; indeed, the only time there's any vault activity is when the disc is loaded (or being imported). And it's perhaps just as well that it's so quiet. As the vault is connected to one of the players – rather than the server – it will, by definition, be located in one of the rooms where movies and CDs are required. Unfortunately, the vault is rather ugly sporting a black trunk with a blue LED display. Stylewise, the vault couldn't be more at odds with the sleek-looking Kaleidescape player if it tried. It needs to be tucked away out of sight, for it is almost guaranteed to clash with the plush furnishings of the room in which this sort of system will be installed. Kaleidescape acknowledges this, explaining that the vault was essentially a bought-in solution intended to speed up the readying of its systems for Blu-ray. Work is also underway on a combined M300-class player and 320-disc carousel, which could be on sale later this year. This 'Integrated Disc Vault' will be a whopping 5U high. That may cause problems for those upgrading older systems based around the KPLAYER-6000, especially if custom cabinets are involved. Kaleidescape suggests installing one Integrated Disc Vault in the equipment room alongside the servers. Fair enough, but this does mean that you're wasting a player! As far as I'm concerned, it's a pity that Kaleidescape didn't consider a rack-mounted vault that interfaces with the rest of the system via Ethernet. Under normal circumstances, after all, little data traffic is involved. Having said that, the current vault can also be used to import Blu-rays en masse. The forthcoming Integrated Disc Vault will import DVDs and CDs too. With my demo system plumbed in, importing a recent Blu-ray (Toy Story 3) took just under an hour. DVDs are, however, much quicker and you can watch previously imported media while the task proceeds. Your system must have a valid internet connection, otherwise the unique Kaleidescape metadata cannot be obtained. In addition to cover art, this includes information about the movie or CD. For some concert Blu-rays, the tracklists even include material that was included in one of the special features rather than the movie itself. On the subject of music, I discovered a useful feature when configuring the system for 1080p24 via its web interface. A program stored on the server, known as 'Conductor', will export your Kaleidescape music collection into iTunes so that it can be experienced on an iPod. Not got an iPod? The albums are placed on your computer's hard disk in a series of folders. Three quality levels are available, but none of them is an uncompressed (PCM) option. A pity, considering that CDs are held on the servers in this raw form. But the main reason for taking the Kaleidescape route is the sheer ease with which it will allow you to enjoy your movie and music collections. Shown onscreen is a carousel of covers, which you can whizz around via the backlit handset. An alternative is the category list (one is dedicated to Blu-ray). The system will even shuffle covers, so that titles similar to what you've just played are more visible. And although Kaleidescape will jump to a feature film – thereby skipping trailers and so on, you can still access the disc menu and explore special features. Performance is of the same standard as a high-end Blu-ray player. That means sheer visual involvement, especially from BD discs. An expansive depth, razor-sharp detail, complete freedom from streaming 'glitches' and unquestionable colour fidelity characterise what you'll see on a display of appropriate pedigree. They're accompanied by faithfully excavated soundtracks; naturally, HD audio is supported via HDMI. Upscaled DVDs are also deftly handled, but those with the highest-quality displays or top-notch scalers might want to experiment with the native (480i/576i) options that the Kaleidescape's web-driven configurator gives you for standard-definition content. Independent output modes for HD and SD content? An excellent idea, and one that should be adopted by other manufacturers. 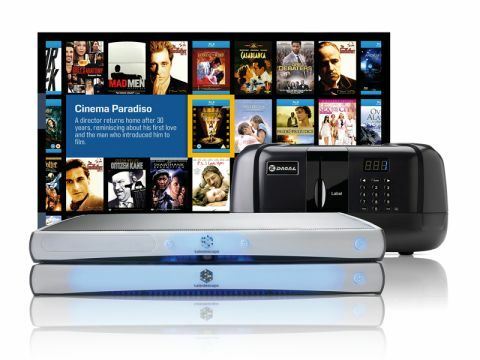 To sum up, Kaleidescape has successfully brought its superb system into the Blu-ray era. I do have reservations, though. Not only about where the vault is located, but its 100-disc limit (dedicated movie fans could easily have more than 100 BDs) and the lack of 3D Blu-ray support. The forthcoming Integrated Disc Vault will remedy the former, but will it also take Kaleidescape owners into the next dimension?